Benti and his wife, Adanech, had been married 14 years when they learned that Benti’s 5-year-old niece, Bethlehem, needed a home. Unable to have biological children, they had prayed many years for a child. They were thrilled to become parents for the first time. Shortly after Bethlehem joined their family, Benti and Adanech learned about the Bethany Christian Services’ foster-to-adopt program through their church. They were immediately interested in growing their family again, and Bethlehem was excited about becoming a big sister. While Benti and Adanech completed Bethany’s parenting training, Bethany also conducted the family’s background check and home study. Benti began praying diligently that God would lead them to the child who would join their family. In 2011, Benti and Adanech were matched with a bright-eyed, 3-year-old girl. She was a child without a past. She was one of several children brought to the orphanage through a local NGO. There were no written records about her background. She had no known parents, birthdate, or name—workers at the orphanage called her Dessie. The local Women and Children Affairs Office considered her case; with no way to search for biological family, they referred her to Bethany’s foster-to-adopt program with hopes that she might find a permanent family. The first time Benti and Adanech met Dessie, the case worker noticed that something seemed off. For the first several minutes of the visit, Benti stood quietly aside, looking astonished, while Adanech and Dessie played. The case worker wasn’t sure what to make it, but dismissed it when he joined in the play. He later shared what had caused his reaction: Dessie was the child he had seen in his dreams, the child he had asked God to lead them to. He was overwhelmed by how specifically God had answered His prayer. Additional meetings followed over the next two weeks so they could spend more time with Dessie, and she and Bethlehem could meet. The next step was an overnight visit, after which neither of the girls wanted to be apart. They both cried when Dessie returned to the orphanage—but they were soon rejoined when Dessie entered foster care on May 27, 2011. Dessie didn’t take long to adjust to her new foster home. She started calling Benti and Adanech “Emami” and “Ababi” (“Mom” and “Dad”) right away. She and Bethlehem became inseparable with Dessie wanting to do everything just like her big sister, from wearing the same clothes to having her hair braided the same way. But Dessie still didn’t understand that her home and family would become permanent. Each time the Bethany social worker came to follow up on her progress, Dessie worried that the purpose of the visit was to take her back to the orphanage. When Benti took her to her first day of school, she cried and held tight to his legs, afraid that her "ababi" was leaving her. Benti and Adanech assured her that the social worker was only there to visit, and that school was only during the day. They would always be there to pick her up and bring her home. On December 21, 2012, Benti and Adanech legally adopted Dessie and officially made her a member of their family. One of the first children in Bethany’s Ethiopia foster-to-adopt program, Dessie found her forever family right in her home country—the child without a past would have a future. When Dessie came to her new family, they gave her a new name, Ruth. Her dad said her story reminded him of the biblical story of a faithful woman who chose to follow Naomi in her distress even though Naomi had nothing to offer her. Benti said in terms of wealth, his family may not have much to offer, but they can give her the love and care she deserves. In the Bible, we read that by faith, Ruth traded her past for a legacy that, generations later, led to the genealogy of Jesus. Today, Ruth loves to draw and color pictures, play with her sister, and help Benti care for the family’s three cows. She’s even doing well in school. Benti and Adanech waited many years to have children, and they believe both Ruth and Bethlehem can anticipate a promising future with the love, support, and permanency of a family. 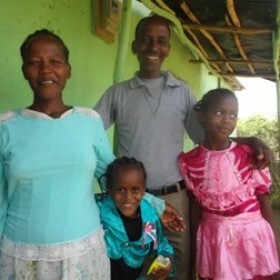 In Ethiopia, more than 5.5 million orphaned children need families. Learn how Bethany's foster-to-adopt program in Ethiopia is moving children out of orphanages and into permanent, loving families in their home country. Visit the RanibowKids.com Countries Area to learn more about adopting internationally.